California scrub jay in Seattle, Washington. The California scrub jay (Aphelocoma californica), is a species of scrub jay native to western North America. It ranges from southern British Columbia throughout California and western Nevada near Reno to west of the Sierra Nevada. The California scrub jay was once lumped with the island scrub jay, and Woodhouse's scrub jay, collectively called the western scrub jay. The group was also lumped with the Florida scrub jay; the taxon was then called, simply, the scrub jay. The California scrub jay is nonmigratory and can be found in urban areas, where it can become tame and will come to bird feeders. While many refer to scrub jays as "blue jays", the blue jay is a different species of bird entirely. 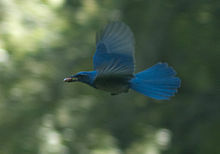 In recent years, the California scrub jay has expanded its range north into the Tsawwassen region of British Columbia. The generic name Aphelocoma derives from Latinized Ancient Greek apheles- (from ἀφελής-) "simple" + Latin coma (from Greek kome κόμη) "hair", in reference to the lack of striped or banded feathers in this genus, compared to other jays. californica, Latin: "from California". The California scrub jay is a medium-sized bird, approximately 27–31 cm (11–12 in) in length (including its tail), with a 39 cm (15 in) wingspan, and about 80 g (2.8 oz) in weight. In general, this species has a blue head, wings, and tail, a gray-brown back, grayish underparts, and white eyebrows. The throat is whitish with a blue necklace. The call or "screech" is described as "harsh and scratchy". True to its name, the California scrub jay inhabits areas of low scrub, preferring pinon-juniper forests, oak woods, and edges of mixed evergreen forests. It also inhabits suburban gardens. California scrub jays, like many other corvids, exploit ephemeral surpluses by storing food in scattered caches within their territories. They rely on highly accurate and complex memories to recover the hidden caches, often after long periods of time. In the process of collecting and storing this food, they have shown an ability to plan ahead in choosing cache sites to provide adequate food volume and variety for the future. Western scrub jays are also able to rely on their accurate observational spatial memories to steal food from caches made by conspecifics. To protect their caches from potential 'pilferers', food storing birds implement a number of strategies to reduce this risk of theft. Western scrub jays are also known for hoarding and burying brightly colored objects. Western scrub jays have a mischievous streak, and they are not above outright theft. They have been caught stealing acorns from acorn woodpecker caches. Some scrub jays steal acorns they have watched other jays hide. When these birds go to hide their own acorns, they check first that no other jays are watching. Recent research has suggested that western scrub jays, along with several other corvids, are among the most intelligent of animals. The brain-to-body mass ratio of adult scrub jays rivals that of chimpanzees and cetaceans, and is dwarfed only by that of humans. Scrub jays are also the only non-primate or non-dolphin shown to plan ahead for the future (known as metacognition), which was previously thought of as a uniquely human trait. Other studies have shown that they can remember locations of over 200 food caches, as well as the food item in each cache and its rate of decay. To protect their caches from pilfering conspecifics, scrub-jays will choose locations out-of-sight of their competitors, or re-cache caches once they are alone, suggesting that they can take into account the perspective of others. California scrub jays also summon others to screech over the body of a dead jay, according to new research from the University of California, Davis. The birds' cacophonous "funerals" can last for up to half an hour. The chicks start off fully gray. The older they get, the more they turn blue. On their heads, chicks tend to have a red crest that resembles a comb. The chick will lose its crest at day seven, just like the way the baby chickens lose their egg tooth at 5–7 days. Nests are built low in trees or bushes, 1–10 m (3.3–32.8 ft) above the ground, primarily by the female, while the male guards her efforts. The nests are sturdy, with an outside diameter of 33–58 cm (13–23 in), constructed on a platform of twigs with moss and dry grasses lined with fine roots and hair. Four to six eggs are laid from March through July, with some regional variations. There are two common shell color variations: pale green with irregular, olive-colored spots or markings; and pale grayish-white to green with reddish-brown spots. The female incubates the eggs for about 16 days. The young leave the nest about 18 days after hatching. The life span of wild California scrub jays is approximately 9 years. The oldest known western scrub jay was found in Castaic, CA, in 1991 and raised in captivity. "Aaron" lived to be 19 years, and 8 months old. Populations are being adversely affected by the West Nile virus, particularly in California's Central Valley. "California" scrub jay (Aphelocoma californica immanis), showing the well-marked breast band of the coastal races. Acorns are a typical food. Another "California" scrub jay. Note bright white plume breaking the breast band. Prominent markings in eye region are typical of male birds. "California" scrub jay fledgling being fed by a relative. Woodhouse's, California, Island, and Florida scrub jay were once considered subspecies of a single "scrub jay" species. They are now believed to be distinct. Beyond the close relationship of the "California" and island scrub jays, resolution of their evolutionary history has proven very difficult. Woodhouse's scrub jay differ in plumage (paler blue above, with an indistinct and usually incomplete breast band) from California scrub jay which are darker blue above with a strongly defined – but not necessarily complete – blue breast band. A large subspecies. Somewhat duller and lighter in color than californica due to gene flow from inland populations. Blue of head and neck less purplish than in woodhouseii group. Back usually quite brownish, underside and especially breast quite whitish, undertail coverts usually tinged pale blue or gray in males. Bill strong, wings and tail fairly short. Coastal SW Oregon from Rogue River valley south to Napa and Sonoma Counties; eastern limit the inner California Coast Ranges. Similar to californica, but head and back more intensely colored, with bright purplish tinge to blue of head. Color similar to nominate, thus darker than immanis and most oocleptica. Relative to nominate californica, blue areas more purplish and brighter, breast darker than rest of underside. From Jackson, Klamath, and Lake Counties, Oregon, through Sacramento and San Joaquin Valleys and surrounding mountains to Kern County, San Francisco Bay area, and Alpine County. Eastwards to Inyo County and Virginia Mountains (Washoe County, Nevada), where it intergrades with nevadae of the woodhouseii group. Quite variable according to the extent of gene flow between this taxon and nevadae. Generally similar to californica but larger; color of head and neck varies in lightness and amount of purplish hue. Back grayish; undertail coverts usually white. Bill usually heavy but variable according to habitat type (less heavy in birds of pinyon woodland). California Coast Ranges from San Mateo County and SE Alameda County to SW Ventura County. Blue of head usually strongly tinged purple. Back bluish-brownish gray, bluer towards the rump. Incomplete bluish-violet breast band. Underside greyish white, darker on the breast. Undertail coverts white tinged with blue. Thighs gray. Rectrices and remiges dark blue, the larger feathers duller. Bill heavy, tip strongly hooked. 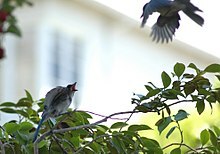 Smaller and darker than californica, with more intense purplish and brown coloration on head and back, respectively; prominent gray streaking on throat and distinct breast collar. Belly with smoky gray wash, lighter in the middle. Generally more intense coloration overall. Bill heavy. Only occurs in single-leaf pinyon woods on Eagle Mountain, Joshua Tree National Park. Smaller, lighter and grayer than californica. Bill not as heavy. Apparently an isolate of hybrid origin between A. c. obscura and nevadae of the woodhouseii group. ^ BirdLife International (2012). "Aphelocoma californica". IUCN Red List of Threatened Species. Version 2013.2. International Union for Conservation of Nature. ^ Clayton, N. S.; Bussey, T. J. & Dickinson, A. (2003). "Can animals recall the past and plan for the future?" (PDF). Nature Reviews. Neuroscience. 4 (8): 685–91. doi:10.1038/nrn1180. PMID 12894243. ^ Raby, C. R.; D. M. Alexis; A. Dickinson; N. S. Clayton (22 February 2007). "Planning for the future by western scrub-jays". Nature. 445 (7130): 919–921. doi:10.1038/nature05575. PMID 17314979. ^ Clayton, N. S.; Dally, J. M. & Emery, N. J. (2007). "Social cognition by food-caching corvids. The western scrub-jay as a natural psychologist". Philosophical Transactions of the Royal Society of London. Series B, Biological Sciences. 362 (1480): 507–22. doi:10.1098/rstb.2006.1992. PMC 2346514. PMID 17309867. ^ Dally, J. M.; Emery, N. J. & Clayton, N. S. (2006). "Food-caching western scrub-jays keep track of who was watching when". Science. 312 (5780): 1662–5. doi:10.1126/science.1126539. PMID 16709747. ^ Correia, SP; Dickinson, A; Clayton, NS (2007). "Western scrub-jays anticipate future needs independently of their current motivational state" (PDF). Current Biology. 17 (10): 856–61. doi:10.1016/j.cub.2007.03.063. PMID 17462894. ^ Clayton, Nicola; Emery, Nathan & Dickinson, Anthony (2006). "The rationality of animal memory: Complex caching strategies of western scrub jays". In Hurley, Susan & Nudds, Matthew (eds.). Rational Animals? (PDF). Oxford University Press. pp. 197–216. ISBN 0198528264. ^ Scrub jays react to their dead, bird study shows: 'Funerals' can last for up to half an hour. Sciencedaily.com (2012-09-11). Retrieved on 2013-03-22. ^ Emslie, Steven D. (1996). "A fossil scrub-jay supports a recent systematic decision" (PDF). Condor. 98 (4): 675–680. doi:10.2307/1369850. ^ Rice, Nathan H.; Martínez-Meyer, Enrique & Peterson, A. Townsend (2003). "Ecological niche differentiation in the Aphelocoma jays: a phylogenetic perspective" (PDF). Biological Journal of the Linnean Society. 80 (3): 369–383. doi:10.1046/j.1095-8312.2003.00242.x. Wikimedia Commons has media related to Western Scrub Jay. This page was last edited on 11 March 2019, at 19:21 (UTC).